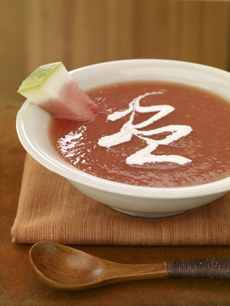 There’s nothing more refreshing than cold fruit soup on a warm day. This summer soup is seasoned with coriander and coconut Water. Coriander, the dried seed of the herb cilantro (which is also called coriander), is not just an herb for Mexican and Pacific Rim dishes. The seed is a chameleon-like spice that brings forth light, clean flavors. Pairing coriander with coconut water, another flavor of the Asian tropics, adds a taste of the tropics to everything from rice to cocktails. Several brands of coconut water are readily available at specialty food stores. Coriander and coconut water are one of McCormick’s 10 flavor trends for 2008. See the other flavor trends. *Coconut water is available in the Latin aisle of most supermarkets and is labeled as either coconut water or coconut juice. Recipe and photo © McCormick & Company. All rights reserved. Other material Lifestyle Direct, Inc. All rights reserved.